anyway, i was asked to make a video of myself answering questions. so 7 questions makes 7 videos. the videos are for Returnees Night in OCF Adelaide 24th Nov. so did quite a rush for it and to upload it on the Multiply account[williamkch] (thank God for Multiply) for the person to download and compile it. so with questions of, what's your feeling now that you've graduated? what did going home to Malaysia feel like? what were the major differences? what difficult issues? what was your experience/the process in finding a job? what joys did you experience as a returnee? what are your last words to ocfers and returnees? she wanted about more than 1 min but less than 2 min per question. till i found out that a 1 minute video takes about 1 hour upload. don't even think about 2 minutes. so i made it all 20 seconds except for last words which is 1 minute-plus. the questions kind of gave me a check on myself. it brings me joy again to continue to be able to do something and give to OCF. to be able to share what little wisdom i have that God has taught me. 1) i'm giving a 1-minute sermon for the rest of their life. 2) i'm going to die in 1 minute. what's my last words? one thing for sure, i knew it was important. what are the fundamentals? i've been listening to many songs some time ago but didn't post about it. i want to share this song, for it talks of us who are walking on this narrow journey. whether a christian for a long time or someone of new faith, this song presents to us the fundamentals/basics of life - to where it all began for each of us. i believe that the journey can be pretty lonely. and many times it is God's grace and love that just holds us, for He is our strength, our Rock and our Redeemer. He is our provider in our time of need. His grace is sufficient for us. just came back from the TRAC conference today. it's nice to be able to attend. the teaching sessions were quite good. plus i haven't seen so many pastors at one go. broke my previous record. its compulsory for all the pastors to attend this annual AGM conference. being a pastor is tough. there are so many issues to deal with in their life. and this is only just within the church. don't even talk about going out into the world yet. there was an ordination of a pastor today. welcoming a pastor into the ministry. okay... my mind suddenly came to a halt. just now, my thoughts were about the many things i have heard and seen that happens in churches as i was growing up and also till now. its quite saddening. its not the same as OCF, obviously. it stumbles people. it's surprising how people change and i won't be surprised at how others who are good and faithful gets discourage or pick-up the bad habits and forget the Lord whom they love. okay. i better stop. its only 8.35pm. but i'm tired. may have to run on caffeine tomorrow at work. i solved the problem. spent 1 and half weeks. and earlier, i had to redo it from the start because of leaving a decimal point. after going through a lot of mess, the data did not equal. it could not be reconciled. the difference is by the millions! i struggled through and kind of reached the solution. but it was messy and a complicated way to get the solution. i looked at it. its crappy work. certainly not good. i set it aside and started it all over again but this time having done it before. i finished it in half a day. i reconciled all the data. all formulas in each cell checked and corrected. its good. oooo... how could i forget? ee leon is in malaysia for 1 month. he came down to KL for 3 days. met up with him last night together with chok and yvonne. its really great. so nice to see ee leon and chok again. haha... and i'll be going for the TRAC national conference. TRinity Annual Conference = all the english methodist churches in malaysia. its in kuantan and i'll be going down with my parents. all the pastors and church leaders will be there. scary... its from saturday till tuesday. my supervisor allowed me to take leave on monday and tuesday. i am glad that i still finish my work fast and early. my life-defence is getting battered. the defence is good. but when getting knocked on day after day... its not a really nice feeling. plus now that i am going to serve in some ministries, more problems comes up. i was looking through a book that had lifted me up when i was in adelaide. 'Finding Peace' by Charles Stanley. it brings back memories. the not-so-good memories. i'm still kind of amazed that i got through it. i didn't expect i could do it. i just never gave up. i wanted to fight on. and i did got through. i definitely know its not on my own. with God and the people, no, the Brothers and Sisters that He placed around me. - God is Always in control. - i am His servant. i just so want to serve God to the fullest especially in ministry now. - i fear. and God comforts because His presence is always with me and He is my God. - i feel weakness. and God strengthens. - God knows i need help. - God knows the crazy things that i will get as i do my best to serve Him in ministry and He will uphold me as long as i am righteous and obey His commands. lets see... now it is one month and 2 weeks that i have worked. i am starting to feel the strain. calculatingly, i am having a 60 hour week. the past few days my brain's been half dead going to work. and having an analytics type of job that requires the mind, its not a good thing to happen. its like, the computer hanging on you while trying to process something. so my mind hangs on me while trying to think of a solution. i don't think i'm managing my energy as well as i could. i have to be more disciplined now and standardized my sleeping time. i work 12 hours. wake up at 6.30am. travel. work. and come back at 8pm. and to have 8 hours sleep, i have to sleep by 10.30pm. that gives me 2 1/2 hours to do what i want. i have to eat dinner. i have to bathe. so how much time do i have left? i want to make sure that i spend time with my parents. its going good. but i also have been cutting time out for myself. practise piano everyday and quiet time. so i don't have enough sleep. plus, i exercise everyday, pushing myself to keep fit. so i'm really exhausted. slept at 12 for 2 days this week. not good. not wise at all. i worked 3 days on one thing at work. only to find that it is flawed. all because of a decimal dot that was in the raw data. it happenned at the beginning of the programme, which leads on to extraction and producing reports. its one of those things where though the format is wrong, the programme still works. now i understand even more what it is the working life. i adjusted quite okay to it. and am just trying stuff here and there, trying to see what's the limit. and now fine-tuning a regular schedule that is as balanced as it can be. i am starting to feel the strain. i'm actually quite surprised i lasted quite long and now only feeling a bit. alright man... work is work. psalms is one of my favourite books besides the last few letters of the bible. let's go back to one of the comforting psalms as i remember my dear brothers and sisters, OCFers in Adelaide, taking their exams starting last saturday. the holy place where Most High dwells. saturday, MYF was encouraging. indeed, fellowship is building again. of course these things take time and its good to have a start. yeah... the hobart convention was full of seniors who have finished and were going to be returnees. anyway... Walk His Trail is about the missionary Jim Elliot. uh.. google it up. he and 5 others were matyred by the indians in ecuador that they were reaching out to. 1956. their deaths, besides shocking the world, impacted so many people and the growth for missions was exponential. they were only in their 20's. his wife, Elisabeth Elliot, is an example in her life and also her testimony of God's grace and peace and guidance is something to be awed. as the presentation started, they spoke and the microphones weren't that clear and a few spoke quite fast. so i had to strain my ears to catch what they were saying (uh oh, the music side coming out of me. however i put that away so that i can learn and receive what is presented). i'm sure the presentation touched, taught, created awareness, awed, called, convicted, teared and impacted everyone in some way. the Auca indians had killed some Shell employees in the earlier years. but no impact. Jim Elliot died for God. he left little of value, as the world regards values. but look at the impact that he had around the world. elisabeth elliot continued to reach out to the Auca indians. the Auca indians who killed the group of 5, accepted Jesus and followed Him. and as they witness to others, others also went out to other tribes and were willing to die for Christ. one of the missionaries sons was baptized by the Auca indian who killed his father. one of the grandchildren calls the Auca indian who killed her grandfather, 'Grandfather'. "He is no fool, who gives what he cannot keep, to gain what he cannot lose." 2 nights ago.. i lie down... and just think. from Middle English swot, from Old English swAt. i remember i was taught that it meant Study WithOut Thinking. heh heh..
i just prayed for them. i know i can't be there (of course) but i know that God can be there. He is always there, everywhere, with them. i sent them an sms that they remember God. for those who know what i went through, i'll tell you that the same God that has planned my uni life (all the joy and pain) and faithfully brought me through it, is ever faithful and will also bring YOU through. every single step on the path or off the path is in God's control. i really can't remember who told me this but i'd really really like to thank him. i hold on to it all the time. "in all these pain, take heart to know that God is doing something in you. God is preparing you for His purpose. something so big you'd never dream of. are you going to be faithful to walk in His path all the way? and in all these pain, you are being tried and tested. do you persevere through it all? and when you were persevering, were you faithful and honouring God and living for Him?" well, here i am, God. grounded, mashed, broken, moulded, polished, tried and tested. is there gold? my days are passing pretty slowly. most likely because i keep on counting my days from august 13th. 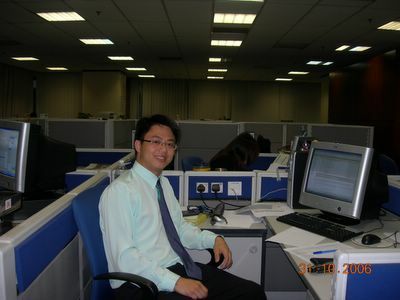 well well, the latest photo of myself at the office. looking good, eh?